It's not a powerhouse, but Mitsubishi's GDI turbo engine shows a glimpse of this company's future hi-po drivetrains. 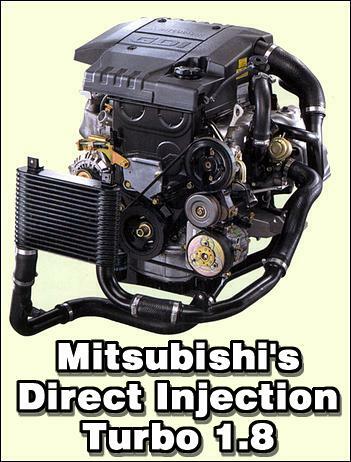 The Gasoline Direct Injection engine has been heralded around the world as an engine that is much kinder to the environment with­out sacrificing the power and response that drivers want. As a natural development step, Mitsubishi has mated their GDI designs with several different com­ponents systems, called the GDI Sigma series. Development has occurred in four different tech­nologies: CVT, HEV, ASG and turbocharging. In 2000, three of these technologies were introduced in the Japanese market. A limited-release Pistachio was fitted with the GDI ASG system. The latest Lancer takes full advantage of INVECS-III CVT. 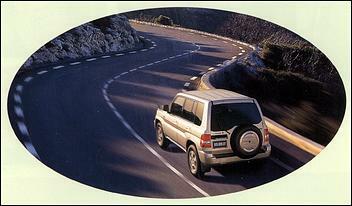 The Pajero iO 5-door is powered by the 1.8-litre GDI Turbo engine. In this article, we will focus on the GDI Turbo engine, which generates extra torque at both low and mid ranges for a more dynamic and relaxed performance, together with fuel economy that is on a par or better than that of a natu­rally aspirated engine of the same class. Emissions Complies with Japanese 2000 Emissions regulations and clears 2010 fuel consumption standards. The 1.8-litre GDI Turbo (4G93) operates in an ultra-lean (air-rich) mode under low-speed, low-load conditions and so produces a larger quantity of exhaust gas that is recirculated over the turbocharger turbine. This keeps the turbine turning faster while the throttle is closed and therefore reduces turbo-lag when the driver opens the throttle to accelerate, giving more seamless and smoother response. Valve configuration DOHC 16-valve ? ? Intake control Electronic ? ? Supercharging Turbocharger with intercooler N.A. N.A. Petrol Lead-free premium Lead-free premium (or lead-free regular) ? 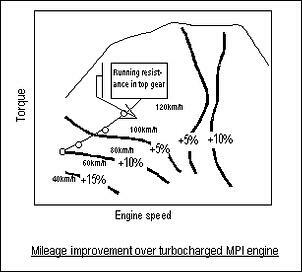 Existing turbocharged multi-port injection engines suffer from turbo-lag, or the delay in boost response. This stems from the delay in acceleration of turbine speed when the throttle is opened, and is due to the slow turbine speed at low loads when there is only a small exhaust gas flow. 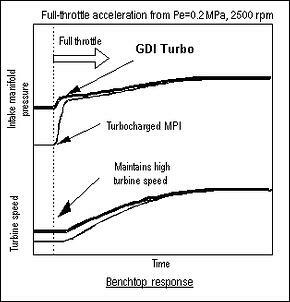 The GDI Turbo engine, however, operates in a lean-burn mode at low loads, thereby producing almost twice the exhaust gas flow as an engine operating under stoichiometric (air/fuel ratio of ~ 14.7:1) conditions. The turbine is therefore already spinning at a higher speed when the driver opens the throttle to start accelerating, and so turbo-lag is significantly reduced. 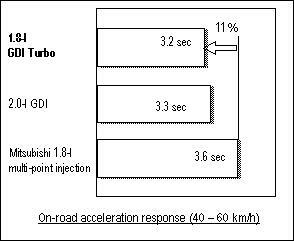 Response in a car powered by the GDI Turbo engine is faster than in one powered by a turbocharged multi-port injection engine. 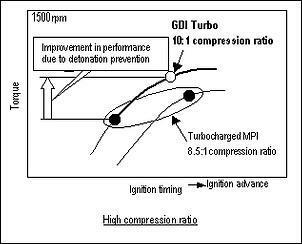 The detonation control technologies inherent to the GDI engine (intake air cooling by using the latent heat of vaporization of the fuel spray, and two-stage mixture formation) enable the use of a 10:1 compression ratio - very high for a turbocharged engine. This enables higher low-end and mid-range torque than is possible with a normal turbocharged engine. 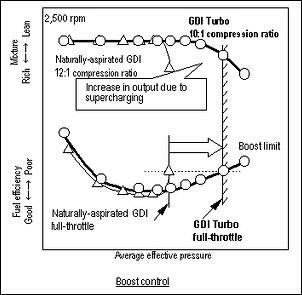 In the GDI Turbo engine, boost pressure is suppressed slightly in the high supercharging zone to realize virtually the same fuel efficiency as for a naturally aspirated GDI engine at full throttle, thereby preventing a deterioration in fuel economy. 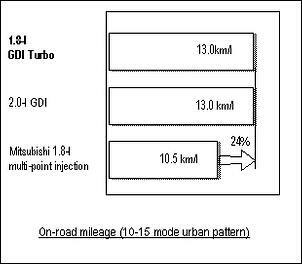 The 10-15 Urban Driving Cycle is a Japanese industry standard that measures the mileage and the amount of exhaust gas produced by a petrol-powered vehicle in urban driving. A set program of accelerations, constant running and decelerations for given durations of time and at set speeds, including engine idling, 20 km/h, 40 km/h, 50 km/h, 60 km/h and 70 km/h make up the urban driving model. The intake cooling and the two-stage mixture detonation control technologies inherent in the GDI engine enable the use of a 10:1 compression ratio - very high for a turbocharged engine. This enables higher low-end and mid-range torque than is possible with a normal turbocharged engine. The new 1.8-liter GDI Turbo engine complies with current Japanese emissions regulations and clears 2010 fuel consumption standards. The 1.8-litre GDI Turbo power unit exploits the properties inherent to GDI technology to eliminate the deterioration in fuel economy that accompanies existing turbocharged engines and to deliver high response optimally balanced with super-low fuel consumption. The GDI Turbo engine achieves better fuel efficiency than a turbocharged multi-port engine at all engine speeds. The result is that the GDI Turbo engine achieves the same mileage as a naturally aspirated GDI engine and much better mileage than a turbocharged multi-port engine at all engine speeds. Other factors contributing to the significant improvement in 10-15 mode urban pattern mileage are greater precision in the fuel injection, engine management and automatic transmission control systems, a lower idling speed and other efficiency enhancing improvements. Other AutoSpeed stories on GDI: "Not so Nuts" and "The Mitsubishi SUW (Smart Utility Wagon) Advance Concept Vehicle"